Any critic who aims to single out the very best, will automatically alienate the rest of the contemporary art world and will become a pariah and a bête noir. Perhaps this helps explain why there are so few great critics as compared to great artists. Often there is only one great critic of an age. Meier Graefe and Clement Greenberg were both unique in their time as was Baudelaire, Ruskin and Diderot. The longer Clem lived and the bigger the art world became, the more unpopular he became. Today his taste is totally out of fashion but he is still indispensable as a coordinate and touchstone and therefore still referred to constantly. Like any great critic, Clem had the empathy and imagination to let his taste be shaped by the greatest artists of his time, and the art world still has not caught up with him. If it is true that great art eventually passed him by, this was only after 40 years of being right about it. Clem was also a great “studio critic”, in that, like a great editor, he could help one to become one’s self, to realize one’s own vision more clearly. Clem did this by stating his own vision and challenging the artist to creatively respond. When art stopped him, baffled him, surprised him, or proved him wrong, he was delighted. He loved expanding his mind and eye. And he was great at helping others believe in themselves. Of course, like any critic, Clem had his limitations and I will point to some of those below. As has often been said, Clem’s total commitment to express himself could seem like arrogance and even megalomania. He was the only great “eye” among the critics, and this led him to believe in his indispensability. “I became The True Massiah”, as he would jokingly say. He asked me once “why does all of the great art flow through me?” I also remember telling him that Bill Rubin, the former chief curator at M.O.M.A., had said that the writer was unimportant next to the artist and that I agreed with this. Clem got angry and even nasty. Here was his Achilles heel and it is what tripped him up in handling the David Smith Estate. It certainly was a mistake not to preserve Smith’s painted sculptures, which he left out in the field in Bolton Landing after Smith died. Nonetheless, Clem’s arrogance was part and parcel with his genius, his creative personality, or so it seems to me. You had to take him whole. I met Clem in the early 1960’s when I was a graduate student at Harvard studying Art History. I found myself president of the graduate student club and responsible for the lecture series that year. I had been following contemporary art closely since my discoveries at the Museum of Modern Art in the late 50’s. At Harvard, I had been turned on to the German art critic, Jules Meier-Graefe by my professor Frederick Deknatel. So I chose the theme of contemporary art criticism. I invited John Canady the controversial critic of the “New York Times”, Thomas Hess, editor of “Art News”, Harold Rosenberg, Clement Greenberg and others. Not everyone could come. Those students who were keen on contemporary art formed a kind of clique: Michael Fried, Rosiland Krauss, Kermit Champa, and Charles Milliard, and myself. I think it was Michael Fried who helped me make the list. We all enjoyed Clem’s talk immensely. I remember his insistence that the critic needs to be conversant with philosophy as well as look hard and often. Afterward, I took him out to dinner and we hit it off right away. At one point I enthused about a recent show I had seen at M.O.M.A. of contemporary Spanish Art. Clem’s response was “your reactions are coming too easily for you”. I was stopped cold. Later I realized that he was right. I was not being discriminating. I was letting someone else, the M.O.M.A., decide rather than trusting myself. I had formed my outlook toward contemporary art in New York where I had been an undergraduate at Columbia majoring in Art History. I had fallen in love at first sight with the New York School, which I had encountered at the M.O.M.A. in the late 50’s. I saw Clem’s shows at French and Co. in 1959 although I did not know him then. But my professors were not interested. Some were even hostile and dismissive. One called Jackson Pollock “hole in the wall painting”. However there was one member of the faculty who liked contemporary art and that was the legendary Meyer Schapiro. He was the first one to help me believe in my eye. He was very pro contemporary art, but not very critical or demanding. He could expound on the second rate as well as the first. Clem was only interested in excellence and the exceptional. Clem invited me to come and visit him in New York, which I did. I was with him a number of times before I left for Europe in 1963 to research and write my thesis. We kept in touch by mail and wound up writing my thesis on Jules Meier-Graefe, the German critic, who wrote the first Modernist account of modern art and who fought the battles for French Modern Art in Germany at the beginning of the 20th century. Later my thesis was published as a book and I dedicated it to Clem. When I came back from Europe in 1967 and began seeing Clem a lot. He was enormously supportive and encouraging to me, especially about my eye. He encouraged Kenneth Noland, Friedel Dzubas and Jules Olitski to give large pictures to the Wellesley College where I taught. He recommended me as the writer to do books for Noland, Olitski and Caro (the latter never appeared). Above all, it was his support, and that of Lewis Cabot, which led to my appointment as the first Curator of Contemporary Art at Boston’s Museum of Fine Art. Also Clem nominated me for the National Endowment Award for Art Criticism which I received in 1972. Clem was 25 years my senior. He lived in New York, did not work, and was always very up to date as regards contemporary art. He had championed Pollock, Smith and the New York School in the 40’s and 50’s and he did the same for the Color Field School of the late 50’s and 60’s. He pointed to the leadership of Olitski in 1965. By the time we became close, he had been the leading critic for 25 years and he had already made all of his big discoveries. He had already stepped back from writing about individual artists and was turning to broad issues in the history of taste and aesthetics. I was drawn most to criticism but I had an academic and then museum career and before the 80’s never had anything like Clem’s freedom. He was my only living model. None of the other critics of the time had his extraordinary visual gifts and appetite for looking. I was hugely influenced by him to the point of taking on Clem’s mannerisms and ways of speaking. For this, and for being Clem’s protégé, I was held in contempt in many quarters as the most submissive in his circle. The heart of our relationship was our love of art. As James Wolfe said, Clem was an “art junkie”. He described the experience of great art as “dancing 3 feet off the ground”. For me it is the same. And for both of us, if the work was great enough, the more we looked, the better it got. It is an appetite that never sates. And it is an experience we could not get any other way. I would come to the city once every month on a Friday. I would leave my things at Clem’s and, usually accompanied by Michael Steiner, the sculptor, we would spend the rest of the day and evening looking at art and talking about it. Sometimes I stayed with Clem and so mornings we would talk more. This is when he was at his best, one-on-one, before he had begun to drink, which he usually started in the late morning in those years. Then we would go out for more looking and socializing; great shows, visiting the studios of great artists, being the first to witness new creations and endless talk about art, as if it was the most important thing in the world. Often I was so turned on that I couldn’t sleep. Sometimes I stayed with Steiner and the three of us were a tight knit group for over a decade. At the end of the day, there were drinks and dinner and the group got more crowded. We usually wound up in a Chinese restaurant or Max’s Kansas City. Clem loved to be the center of attention. He was, what he called Meyer Shapiro: “a Jewish performer”. After hours of drinking he often picked out someone present to attack, usually over some alleged moral failure. At these points he became persistent, brutal and sometimes vulgar. I never got picked on in the early years, but I do confess to sitting through these exercises in humiliation and enjoying the drama, and raw truth telling atmosphere. Clem characterized himself as a “bully” and relished the role. It was as if the only way he could bare to have certain people around him was to attack them or as if he was testing these people. He drove away many including several members of my graduate student group. I remember one afternoon at Mike Steiner’s he started on Rosalind Krauss about how he “thought more of her than she thought of herself”. Ros froze up and Clem kept battering away. Later Ros and I were in the cab together going uptown and she was crying. Shortly after that Ros had an affair with Robert Morris and changed her taste. Later she attacked Clem in “Art and America” about his handling of the David Smith Estate. She has been a lifelong enemy. On another night in Bennington, N.Y., Clem attacked Michael Fried who also froze up and took a hammering. Clem especially drove away other critics and this was undoubtedly because of his fierce competitiveness. As I will discuss below, he eventually turned on me too, when I began writing regular criticism. Clem sometimes came to Wellesley and Boston and I often traveled to Bennington, VT, where so much exciting art was being made in those years. Later we would travel together to Toronto twice a year when we both served on the Jack Bush estate. We also took trips to England, Paris and Vienna. Sometimes we spent a week of summer vacation together either in Falmouth, Mass, at his mother-in-law’s, or later, at his country home in Norwich. Our daughters spent a lot of time together too and Clem taught my daughter Kay how to swim. Shortly after I did the Olitski show at the Museum of Art in Boston, I was approached by Bill Rubin to come and work for him at M.O.M.A. I was to do exhibitions while Bill would remain in charge of the collection. I would report to Bill and, it turned out, Bill had two special conditions. First, that he have final say about my writings and second, that I not be seen with Clem around town but should distance myself from him. I was flattered by the offer but appalled at the conditions. I was in control at Boston and didn’t like the thought of reporting to someone who was another curator. Looking back, my writing was a bit over the top in the sense that I wrote as a critic with parti pris. Thomas Hess discussing my essay in the museum catalogue which I wrote for the Jules Olitski show compared me to Baudelaire in this respect and I took this as a huge compliment. Later Ted Stebbins, another curator at the museum, called me a “closet critic”, i.e. a critic masquerading as a curator. Bill was probably right to rein in my writing for the M.O.M.A. Still I didn’t like having someone constrain me intellectually. But it was Bill’s injunction that I give up my relationship to Clem that really stuck in my craw. It needs to be said here that Clem and Bill were friends at that point, and I was sometimes with the two of them together. Doubtless Bill’s offer to me was influenced in part by Clem. But Clem was furious when I told him about Bill’s conditions. Clem already held Bill in a certain contempt and used to call him “the enemy”, by which he meant “middlebrow”, a taste for the mediocre when it came to contemporary art. 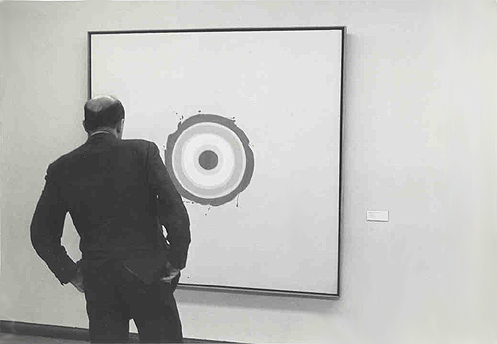 Bill did not have a very good eye for contemporary art and was best dealing with older art where value issues were more settled. On the other hand, Bill was ready to turn contemporary art over to me. Also Bill was being necessarily political in setting his conditions. Curators are not critics who speak only for themselves. Curators work for public institutions in which everything is political and in which the real arbiters of taste are the trustee collector types. Clem did not really get this and he was very unfair to Bill. When I finally turned Bill down he was shocked and hurt. He said “You will ruin your career”. Meantime, Clem broke off relations with Bill over the incident. For my part, I have always had great respect and admiration for Bill, but I would never have traded my relationship with Clem for my day job. Florence Rubenfeld’s biography, Clement Greenberg, A Life, I found a very fair account, especially for an author with little taste of her own and an often poor personal connection to her subject. She does collect the opinions of many who knew Clem and weaves it into a good narrative. She clears up many misconceptions. Clem’s brother Martin was quoted as saying of the book that “it is Clem as I knew him”. I was disappointed that Rosenfeld did not deal with Clem after 1970 when he lost touch with contemporary art. One error is her repeated claim that Clem had a great visual memory. He did not, at least when it came to artworks. In fact Clem prized his poor visual memory believing that it enabled him to see more freshly. This was Clem’s goal, to see each work as if for the first time every time. Often he stood with his back to the viewing wall while a picture was being brought out and placed. Then he would suddenly spin around trying to catch his gut response before ideas or memory kicked in. Clem was disarming in that he readily admitted to all his failings and did not have a high opinion of himself except for his “eye” and, to a lesser extent, his writing. He was enormously stimulating to be around but you had to take him as he was, bent on self expression no matter what or who it hurt. And he was great one-on-one and in our small group when he let his guard down and let himself be teased and badgered. Also he could be a great friend in time of trouble and he was a very tender father to his daughter Sarah. Clem’s ideas have gotten most of the attention, but it was his “eye” that was what was really great about him, at least for me. He was called a “formalist” but he never was comfortable with this term, and rightly so, since it implies a secondary stress on “content” which, in fact, is identical with form in any useful “formalist” model. Indeed, form should be thought of as existing solely for the sake of content. Clem’s kind of criticism might be called aesthetic criticism or connoisseurship, comparative evaluation of originals as to their visible form/content, their focused energy. Of course formalist rhetoric has only practical value and is only one way to approach art. It can be misleading but it also can be very useful. It is the best way to point to the visible artwork itself. As such it has been the parlance of the studio from time immemorial and is not an invention of the modern period, as is often maintained. The chief danger of formalist rhetoric is taking the natural tendencies of the medium and the concept of unity as paramount, while it is life enhancing energy, what Chinese aesthetics calls “chi”, that matters most. Originally a Marxist, Clem himself was tough minded, hard headed and secular when it came to intellectual issues. His childhood had left him with no religious programming. Yet art was his religion, it certainly was what gave meaning to his life and what was his “ultimate concern” – where he was finally “staked out”, as he would say. Max Kosloff once called Clem’s criticism “art mysticism”. For Clem, the visual aesthetic experience was elevating, ineffable and irreplacable. But Clem would never have used the words “spiritual” or “mysticism” in his writings. “Modernism” for Clem was “cool” and his abiding model was the early T.S. Eliot rather than any other art critic. His “criteria” was the Old and Modern Masters of Europe and he loved high style, his main example of which was Cubism. Clem had no sympathy or interest in American’s cultural traditions (he always said he was a Jew before he was an American). He dismissed Whitman and had only contempt for Emerson, two of my heroes. Since I am a tender minded, romantic who was brought up a Baptist, Clem and I were very different in our basic outlook. I remember Clem’s line on Jesus (he had a line on everyone and everything which he constantly repeated when the thing of person came up, as if to prove his consistency, that he had a thought out position on everything.) On Jesus, his line was that Jesus was unable to perform any miracles in Jerusalem. Clem was very pro-urban and was making the point that sophisticated urbanites could not be taken in. Actually, Clem was wrong. Christ cures blind men right after cleansing the temple (Matthew 21:14), not to speak of the Resurrection. Most influential of all his ideas was his notion of Modernism. His idea here is a mixture of the German philosophers, Hegel and Lessing: each medium seeks full consciousness of itself. In painting, this meant “flatness and the delimitation of flatness” or “the integrity of the picture plane”. This has turned out to be a very seductive and misleading idea. Benedetto Croce, in his “Aesthetic”, already warned against Lessing, about the danger of giving too much weight to the medium as opposed to the expression of genius. In painting a bias toward the medium usually means a bias toward the painterly over the linear, color over drawing and is manifested in Clem’s favoring Titian over Michelanglo, Cézanne over Van Gogh, and Matisse over Picasso. Clem’s concept of Modernism sees modern art as an endgame. The Minimalists swallowed this idea whole and Post Modernists define themselves against it. Arthur Danto has reformulated Clem’s idea from the point of view of Conceptual Art, seeing the “end” in, not the mediums self awareness, but in art’s self awareness. In his later years Clem lost interest in the Hegelian view of history and saw modernism merely as the impulse to quality (which he defined as “deep content” and illustrated by the acknowledged great works of the past). In this he adopts the position of Meier-Graefe. Modernism Painting has turned out to be, not a reductive purification of the medium of painting, but the development and exploration of a new medium for painting, namely the new acrylic paints and gels. A synergy of art and technology with no end game in sight. Another of Clem’s views which now seems very wrong to me is that only Modernist Art is major. He resisted the idea that Hopper, Torres or Porter were major and was dismissive of Dali. He undoubtedly would have seen Nerdrum as minor too. Already after seeing Torres Retrospective in Edmonton in 1983, I knew I disagreed with Clem on this. One of the most interesting of Clem’s ideas was the notion that we take in the unity of the work, at a single glance. He didn’t regard Pollock’s long, narrow, scroll shaped paintings as pictures at all. He called them “friezes”. They were too long. Michael Fried, who has his own version of Clem’s ideas, and who, like me, was part of the Greenberg Camp, has gone so far as to proclaim that a painting must be no longer than 14 feet if it is to be wholly graspable visually in a seamless glance and therefore of “the highest quality”. Granted, the single glance does often seem like a good description of our experience but sometimes it does not. Often the effect is cumulative, as for example is Friedel Dzubas’, Crossing which is 57 feet long. The piece comes off as one experience even if though we can nowhere take in the whole evenly at any one instant. And there is a more decisive sense in which we never fully grasp the great artwork, which keeps our eye moving and seems indeterminate and infinite. For my part, I do not want to get too specific as regards the notion of a single glance. We must always remember Kant’s dictum that it is genius who gives the rule to art (not art critics). I have been very influenced by Clem in my writings and undoubtedly still am. But when I began teaching I realized that I was temperamentally and intellectually much closer to Meier-Graefe than I was to Clem, and this has been more and more the case as my life went on. Basically my outlook is the outlook put forward by Jules Meier-Graefe in his Modern Art published in 1904. Beginning with Giotto Modern Art is the tradition of unique individuals, creative geniuses, who shape our vision of what art is and can be. In the last 200 years, with the loss of patronage, the artists have become more isolated, alienated and responsible for art’s subject matter as well as its form/content. Still, this is only an extreme ease of the individualism which began in the 14th century. Meir-Graefe’s view is large and humanistic. He uses romantic, expressionist as well as formalist rhetorics with great brilliance. Next to Meier-Graefe, Clem seems tight and spare as a thinker. When I think of Clem I usually think of him red faced and laughing. I think of our warm fellowship in art and how I can’t image my life without him. He may have created a lot of wreckage but he made a huge contribution to the greatness of the art of his time.